China's $50 Billion Tariff Threat Targets U.S. Soybeans, Cars, Whiskey : The Two-Way China listed 106 items it could hit with tariffs, this time including America's biggest export to the country: soybeans. China currently buys nearly a third of the U.S. soybean crop — but the country plans to impose tariffs, in response to a Trump administration plan. 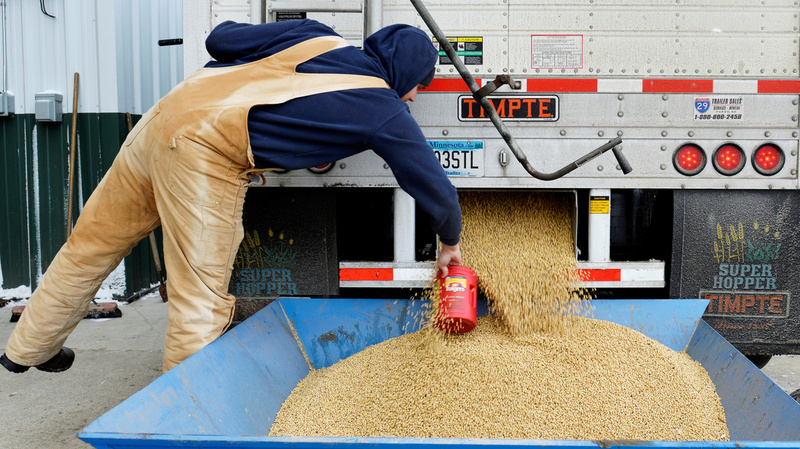 Here, a worker takes a sample from a truckload of soybeans in Fargo, N.D., last December. China's leaders followed President Trump in taking another step toward a new trade war, announcing a plan to put steep tariffs on $50 billion of U.S. imports. China's proposed 25 percent tariffs would target a wide range of American products, from soybeans and whiskey to airplanes and cars. "China currently buys about $14 billion worth of American soybeans each year — almost a third of the entire U.S. crop," NPR's Dan Charles reports for our Newscast unit. "Prices for U.S. soybeans tumbled by 3 to 5 percent" on the news, Dan adds. China is retaliating for President Trump's plan, announced Tuesday, to impose possible tariffs on Chinese goods valuing $50 billion in areas such as aerospace, robotics and machinery. The Chinese Ministry of Commerce calls the U.S. action "an evident violation of rules of the World Trade Organization" that also "threatens China's economic interests and security." As that stern language suggests, there is brinkmanship afoot: The timing of when the Chinese tariffs might take effect is linked to when the Trump administration imposes U.S. tariffs, according to the state-run Xinhua news agency. As for the early economic effects of China's plan, NPR's Rob Schmitz reports from Beijing, "Hong Kong's Hang Seng Index was down 2 percent. Soybean futures tanked on the news, and shares in Boeing in pre-market trading were down by more than 3 percent." Both countries' proposed tariffs promise a 25 percent levy on imported goods — but there are distinct differences between the U.S. and Chinese lists. The Trump administration's tally covers some 1,300 products in a broad range of sectors, from electronics components to medical devices, and from false teeth to detergent chemicals. While that long list quickly created concerns for many businesses, it also suggests the effects of the U.S. tariff might be widely distributed. But when China released its list, it named only 106 items, meaning that the American producers of those products might feel the pain more acutely. And China's list is being seen as targeting agricultural products, many of which come from parts of the U.S. that Republicans consider part of their base. There are also differences in how the two countries presented their tallies. The U.S. list starts with thorium compounds and moves on to depleted uranium, certain isotopes, and the antioxidant supplement coenzyme Q10 — naming the products in an order determined by their eight-digit Harmonized Tariff Schedule numbers. China's list, in contrast, ranks the threatened items in a selective order, naming soybeans as the No. 1 target, followed by corn products, two types of cotton exports, wheat and meat. The tally also includes frozen orange juice and whiskey, tobacco and cars — and that's just the first half of the list. The looming tariffs are the most tangible sign yet of a potential trade war between the world's two largest economies. For the U.S., it would also bring a spat with its biggest trading partner — a relationship in which China has long held an advantage as a net exporter. America's trade in goods with China topped $635 billion in 2017, according to the U.S. Census Bureau. In that year, the U.S. says its goods trade deficit with China was $375.2 billion. Wendy Cutler spent three decades in the U.S. Trade Representative's office, and was a top negotiator. She tells NPR's John Ydstie that she's skeptical that imposing tariffs and threatening a trade war is the best way to proceed. Cutler, who's now at the Asia Society Policy Institute, argues a better approach would be to restrict Chinese investment in the U.S. She says that "would mirror Chinese restrictions against U.S. investment in China. Those types of restrictions are not covered by the WTO, for the most part. So, I would opt, if we wanted to take an action to look at the investment angle." The Trump administration is already laying the groundwork for that, she says. Two weeks ago, Treasury Secretary Steven Mnuchin was tasked by the president to produce a plan within 60 days aimed at restricting Chinese investment.